This is one of the amusing releases from Lustre Pottery in their 'Walking Ware' series. This one is a porcelain Teapot. It has green shoes with thin blue stripes and red spots on the socks. At the rear of the Teapot is the Lustre Pottery stamp with a 'cup' drawing, also indicating the date of 2005. It is also signed Michell. This was made in the Studio in 2007, in fact, with a maximum production of only 100 pieces. Designed by Roger Michell (Lustre Pottery), as are all the Walking Ware products. The jug is in excellent condition though it does feature the odd dent in the casting during the making thereof. The lid has some slight crazing. 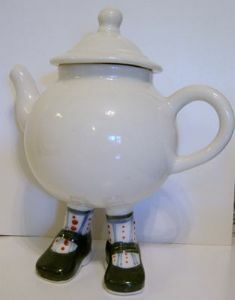 The overall height of the Teapot is 7.25 inches (18.5 cms).